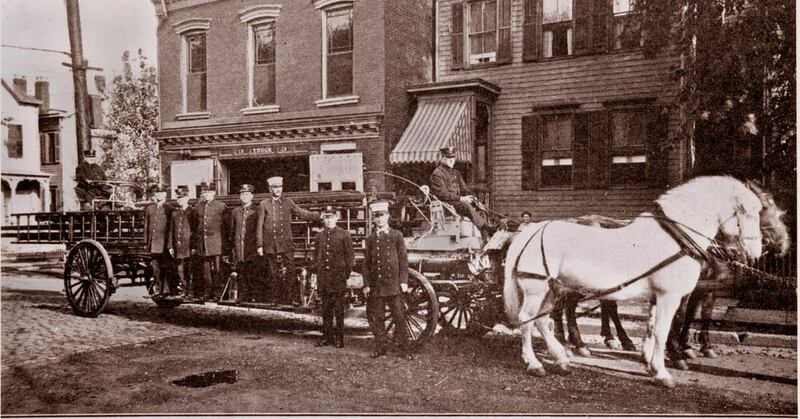 The Paterson Fire Department became partially paid in 1890 and fully paid in 1895. 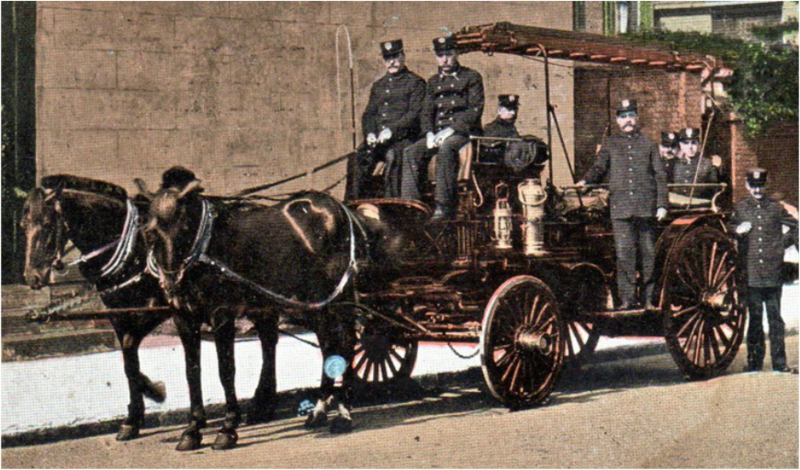 No motorized apparatus appeared before 1910. 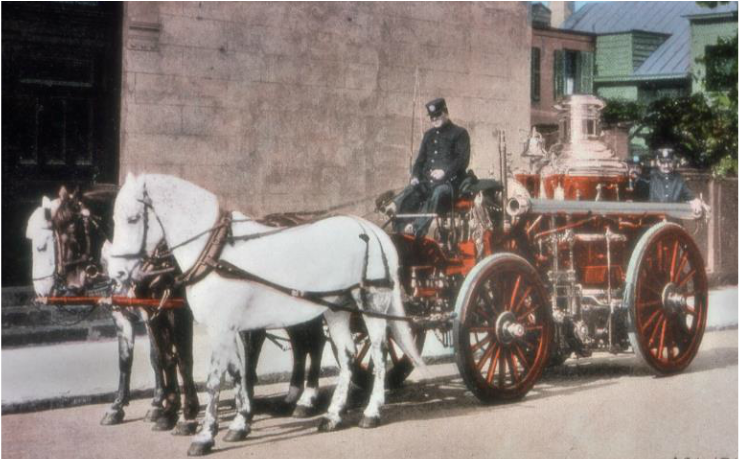 Steam fire Engines first appeared in the Volunteer Department in 1862 at Washington Engine 3. 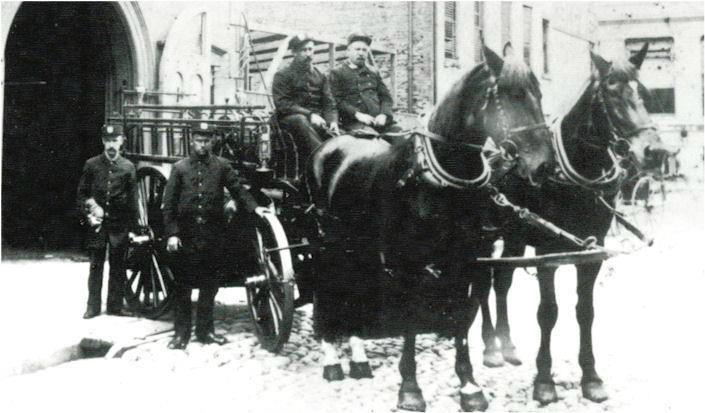 Several other companies followed suit, but horses were not introduced until 1884 by Passaic Engine Company One. 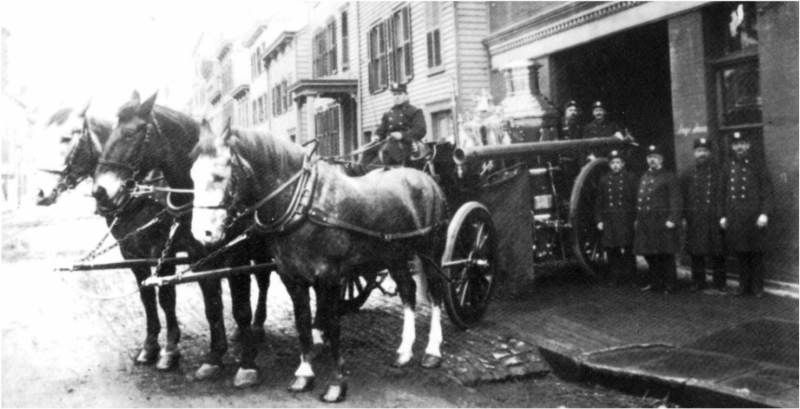 In 1890, all of the apparatus (steamers, hose wagons, chemical wagons and hook and ladder trucks) were pulled by horses. 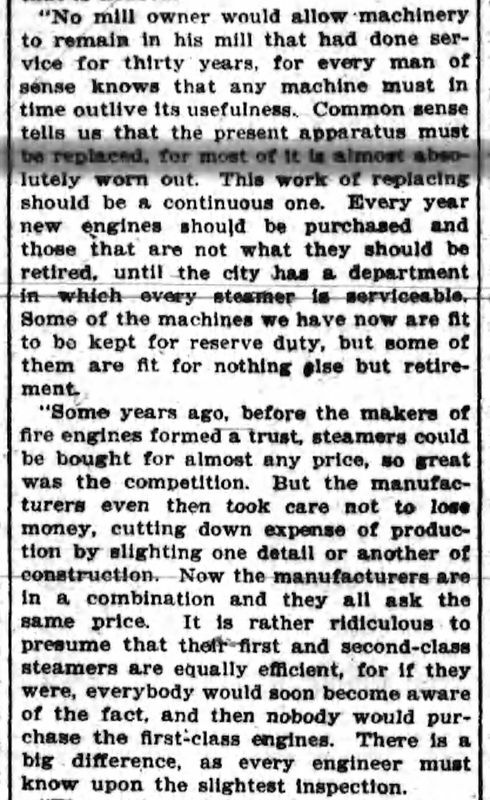 The steamers were modernized after the Great Fire of 1902. 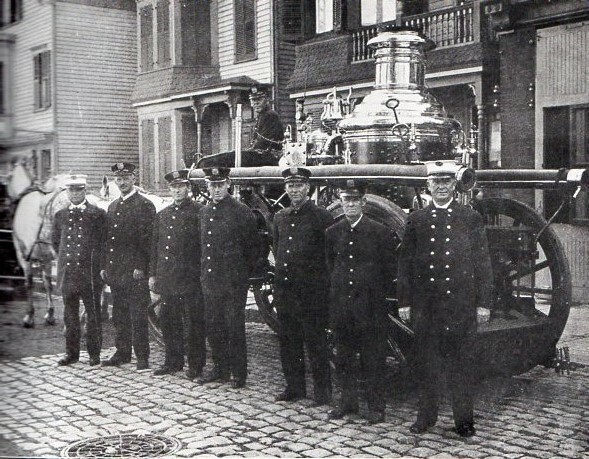 After the town of Paterson burned down in 1902, there was major recognition that the decades old steam apparatus the PFD had needed replacement. 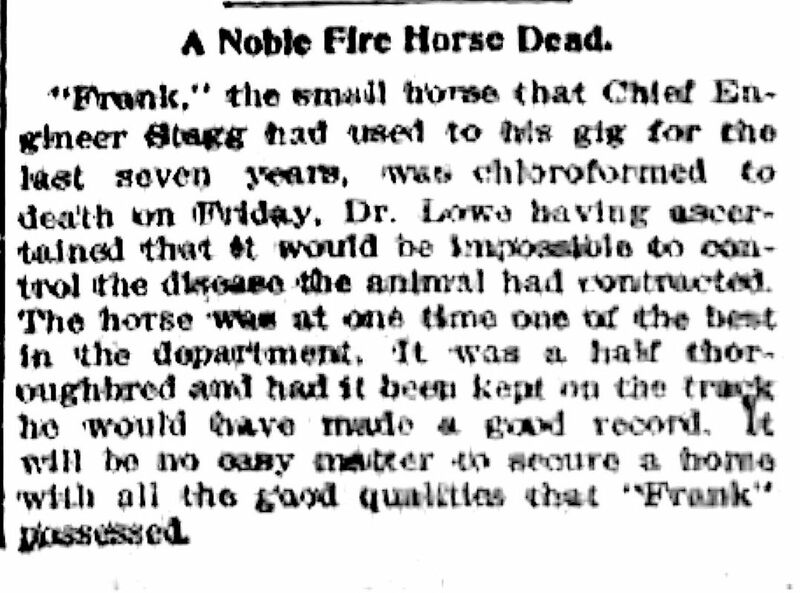 It was up to Chief Stagg to convince the politicians that modern state of the art apparatus were needed. 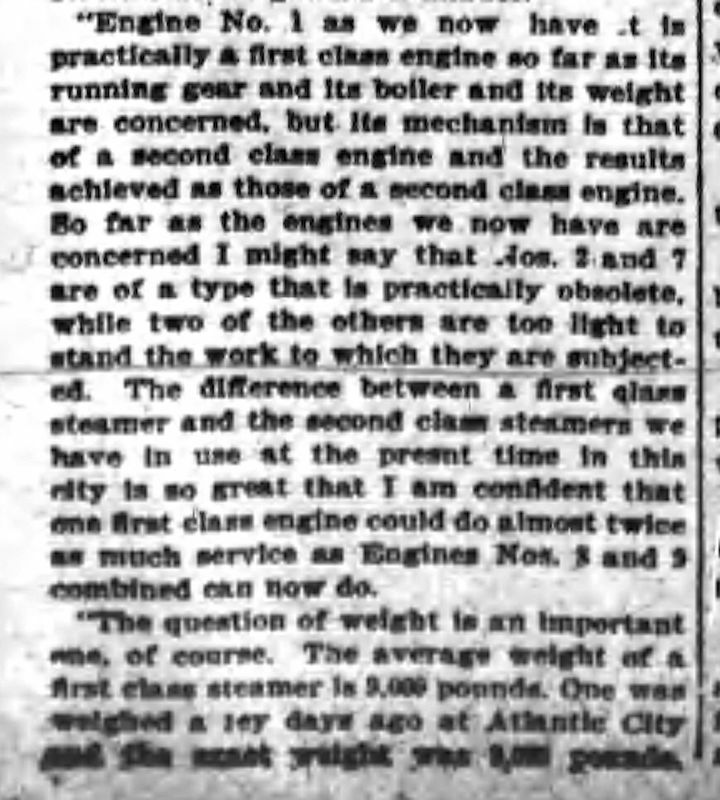 Here is a news article in which the Chief explains the difference between first and third size steamers. 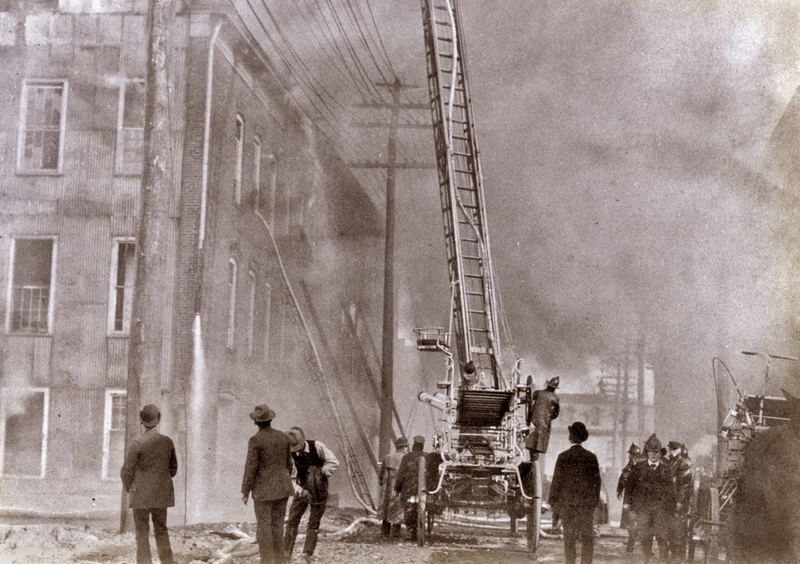 PFD had no first size steamers prior to the big 1902 fire. 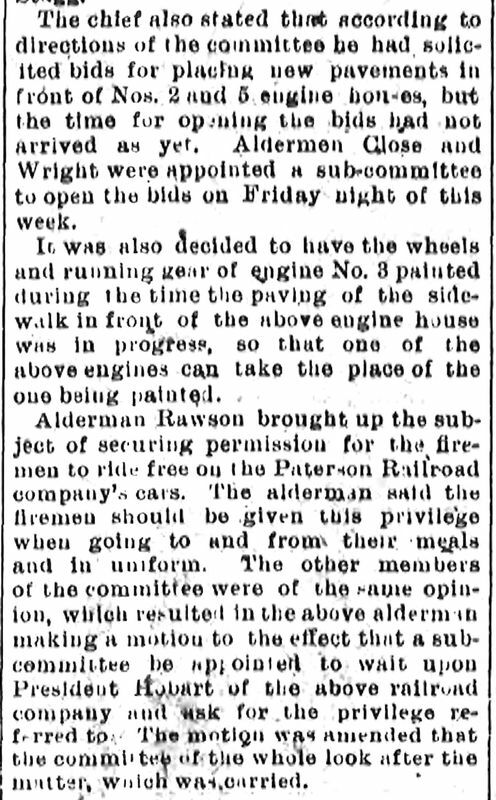 ​ The Chief also discusses the state of streets in Paterson. 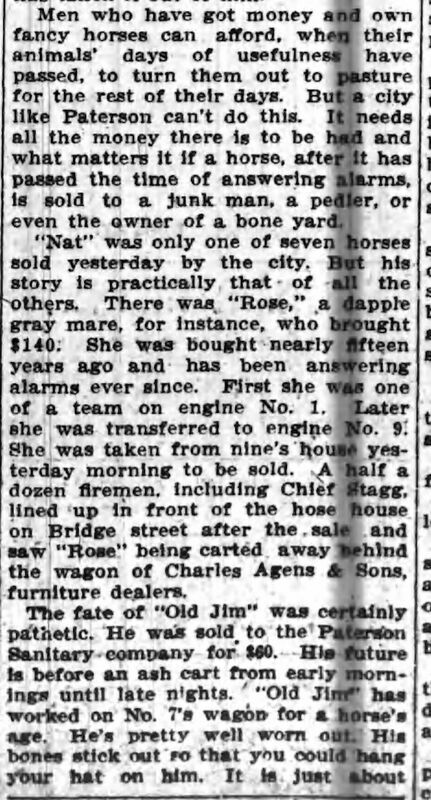 From the December 19, 1902 Morning Call, courtesy of researcher Dennis Morrison. 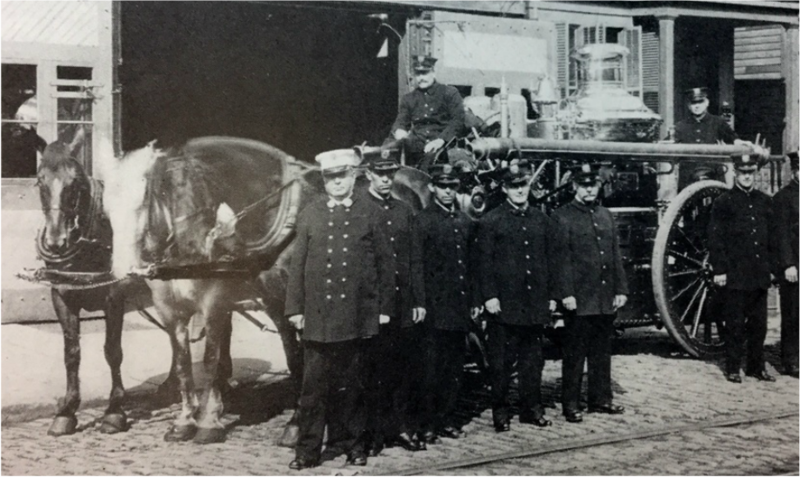 The truck in photo below was rebuilt (fitted with rubber wheels, strengthened and repainted) and drawn by three horses and was the last horse drawn fire apparatus ever used by the PFD: its last run was July 4, 1920. 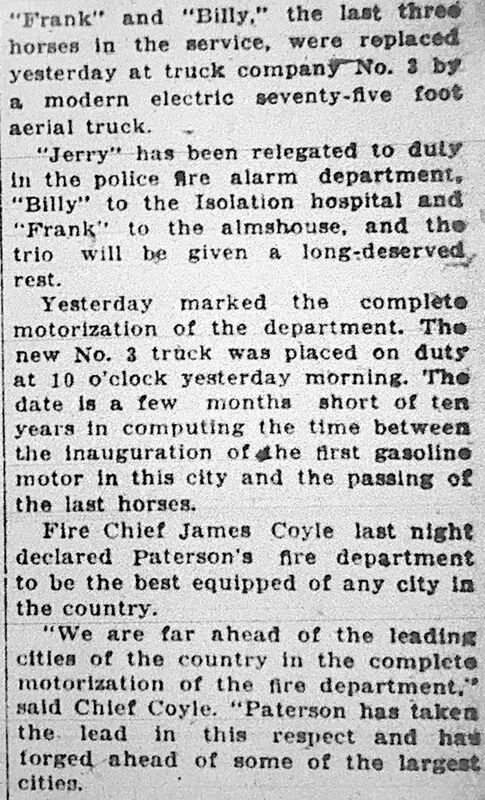 January 3, 1917: Morning Call - Lament of "End of Horse Era"
July 4, 1920: The last alarm response in Paterson using horses was Truck Company 3 responding to Station 634 (East 18th Street and 3rd Avenue) for a fire at 755 River Street. 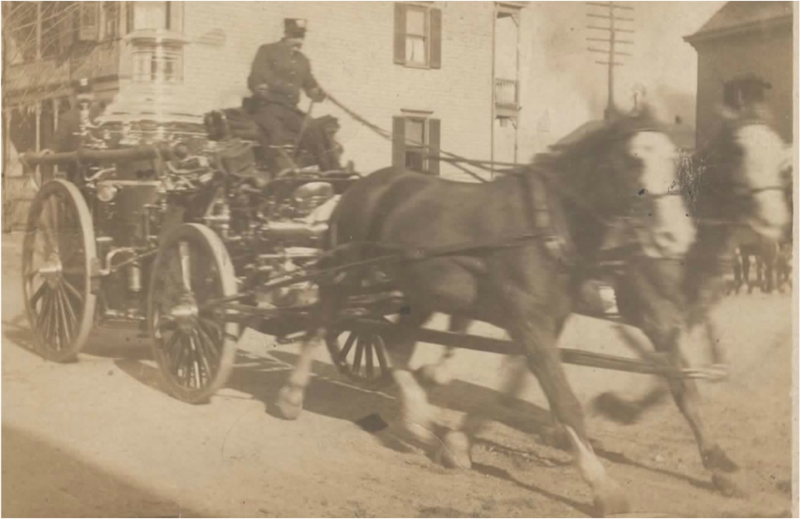 Driver was FF John Doyle and tillerman John Farrell. 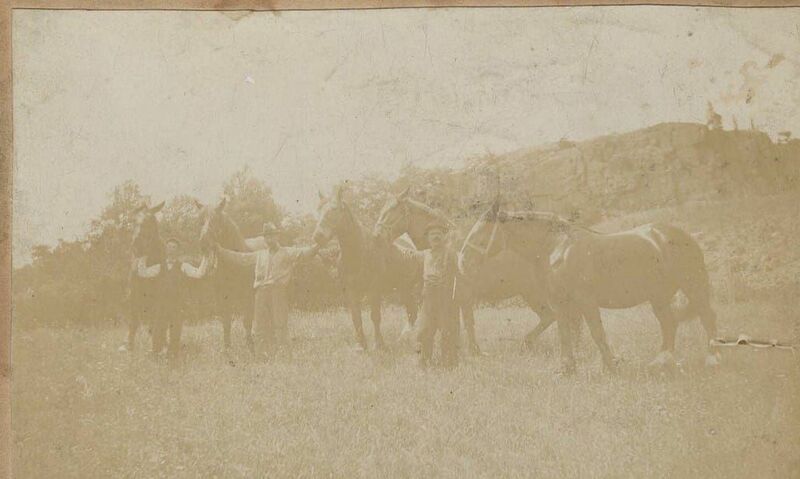 Horses were Jerry, Frank and Billy. 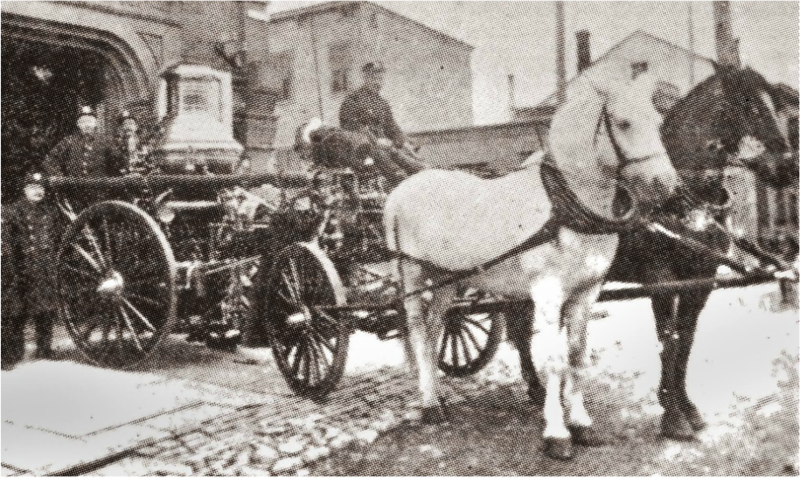 How many of the old-timers of Paterson can look backward to the days when the silk city was in its infancy and remember the famous old steeds that would pull the fire apparatus through dirt clogged, dust ridden streets of Paterson. 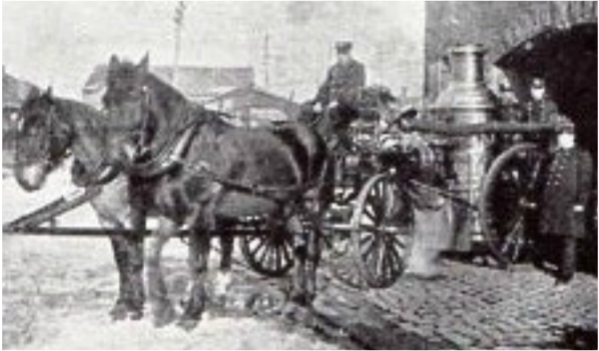 How many of the old-timers can remember the gallant old faithful "Ned" driven by his keeper, George Pfitzenmeyer, raced through the streets atop speed, comparatively faster than some of the autos of the present day? 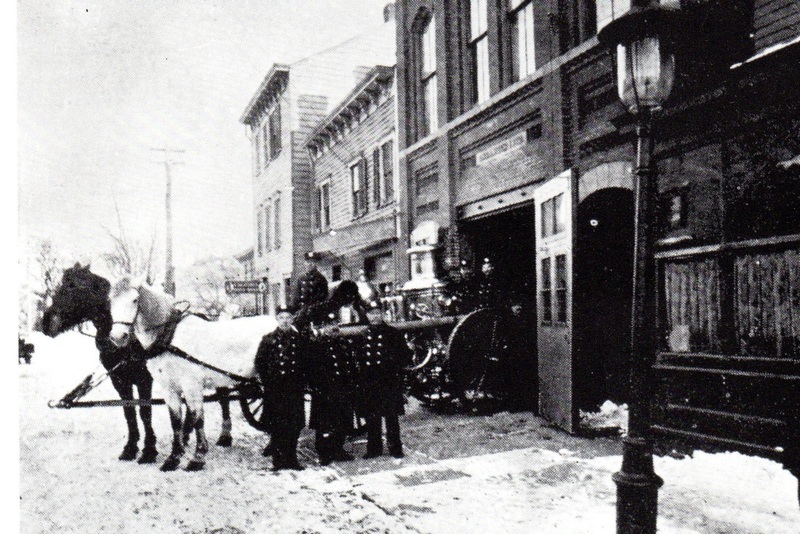 It seems only yesterday to the older members of the Paterson Fire Department that the husky old horses pulled their wagons and engines to the fires. 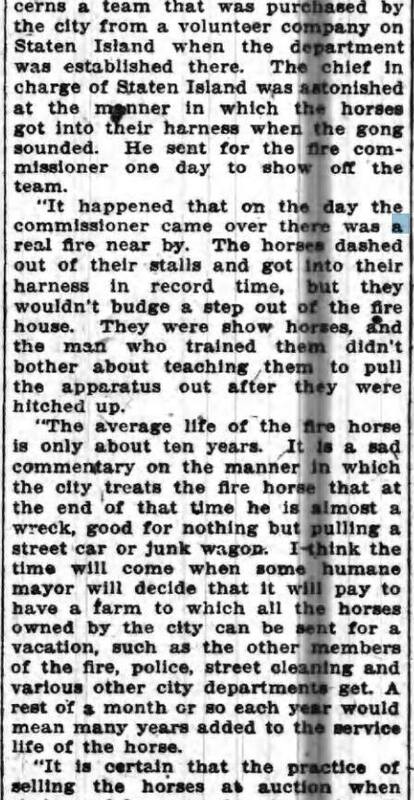 And yet, the last horses that were unhooked from the apparatus left the department more than 15 years ago. 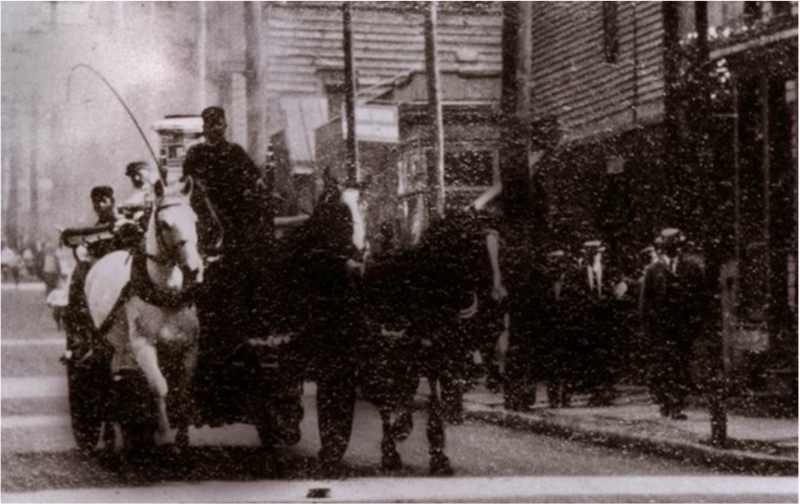 Few of those who saw the horses race through the streets knew what became of them. 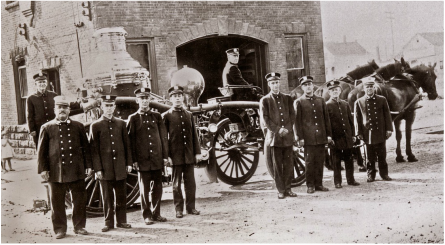 Apparently very few are aware of the fact that the last two of the old faithful's are now living an easy life at Eastside Park. "Arthur" and "Chief" are their names and they pull the grass cutter around the park at odd moments. 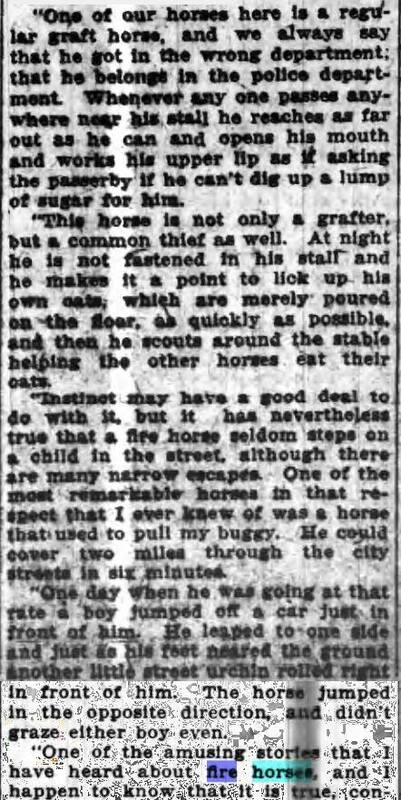 Old Arthur is 30 years and Chief is 29 and the strenuous activity of their former days are but pleasant memories to them. Leisurely they stroll about the park during off times. 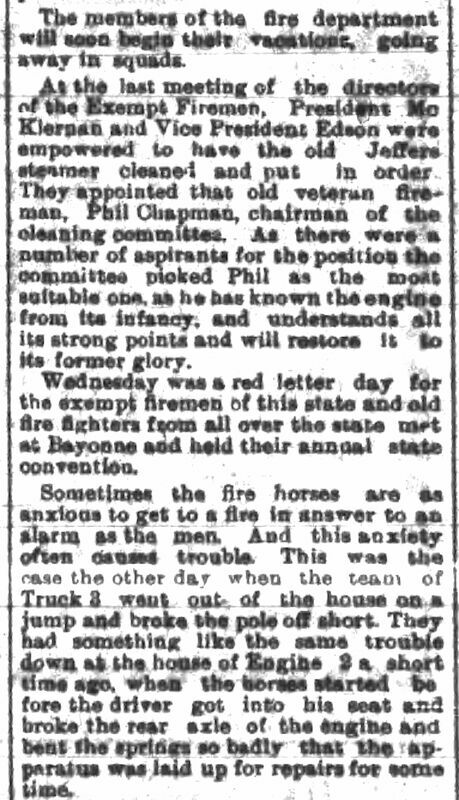 There were days when they ran among the first on ways to fires. 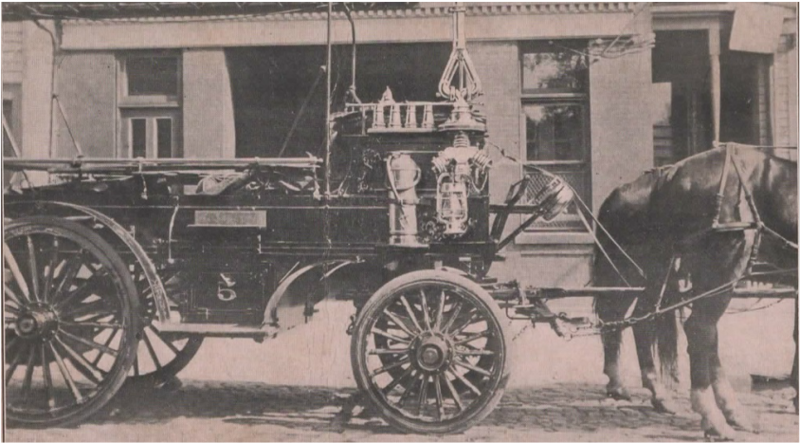 Chief Stagg with driver George Pfitzenmeyer and "Ned"
There were days when they ran among the first on ways to fires and how these people did cheer them as they mightily pulled the apparatus to the scenes of blazes. ​There are times to when Arthur and Chief appear a bit depressed. They miss their buddies badly. They are much alone these days, Their only other pal of former days departed early two years ago. Life is set the same way to them. Slowly they are giving way to the call and soon they will join their buddies. 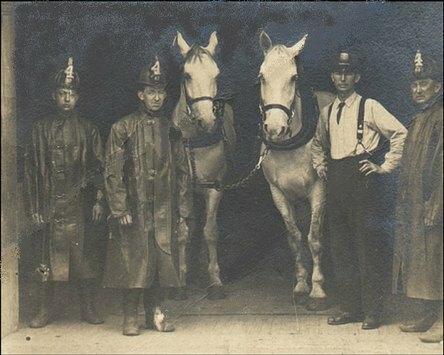 When they hear the clanging of fire bells in a distance they stand ready for action. Chief is a bit smaller than Arthur. 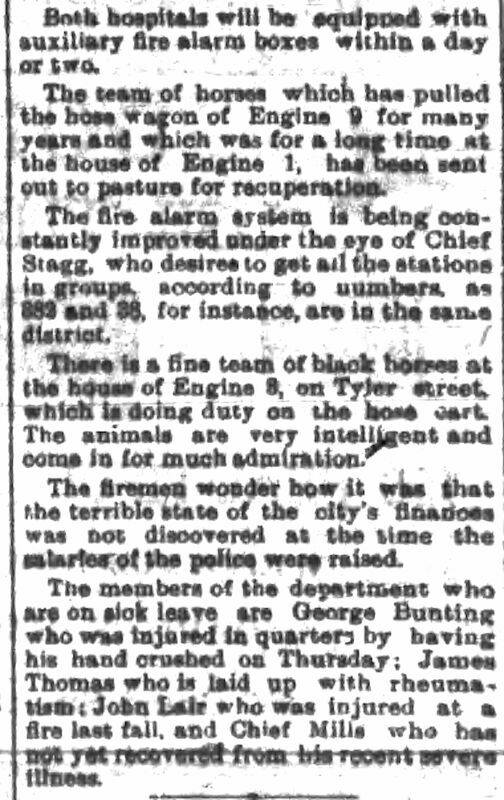 A short while ago Chief was touring the city as the guest of his caretaker and suddenly heard the ringing of the fire bell he was accustomed to. 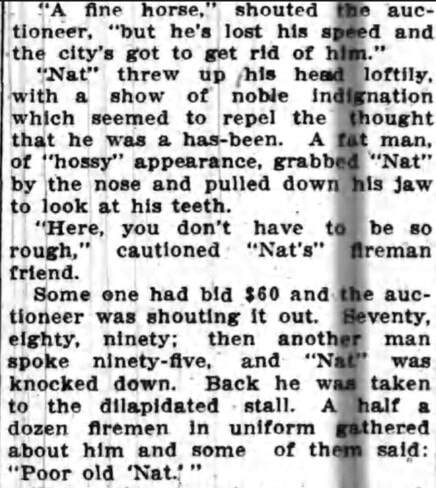 He started off in a mad fashion and his caretakers had their hands full trying to keeping him under control. 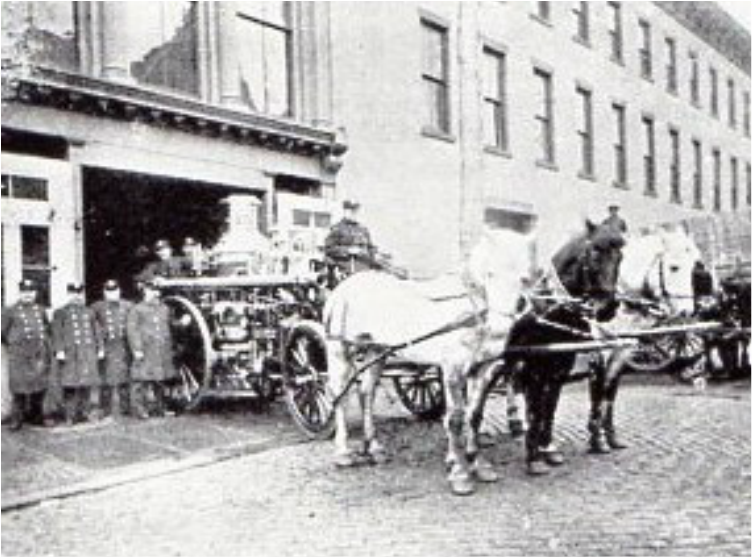 How fondly they chat in their own means of conversation of the days when they graced the firehouses and were the ones who could pull the engines and the fire trucks. 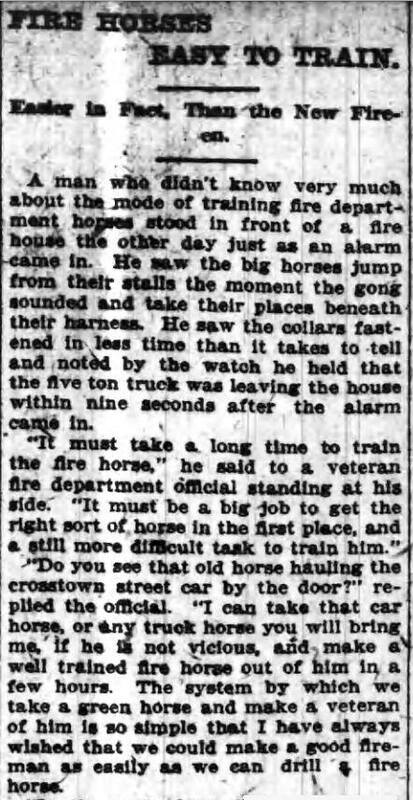 There were 50 or so horses pulling about 21 pieces of apparatus. 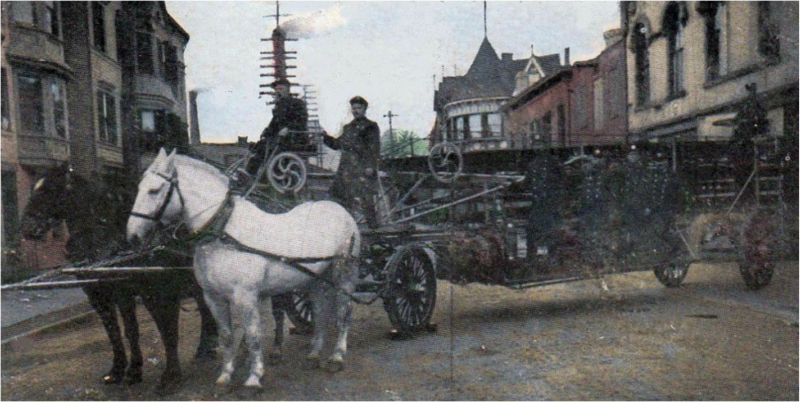 There the aerial trucks, the steam pumping engines and the fire trucks. 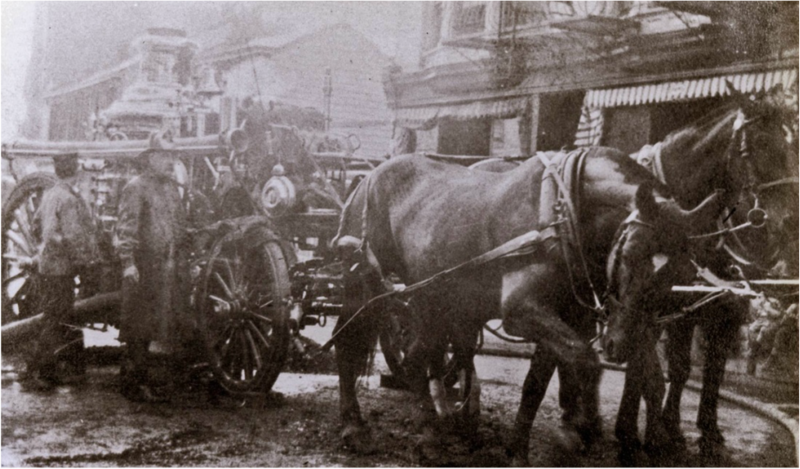 ​There were the firemen who were so attached to their favorites. 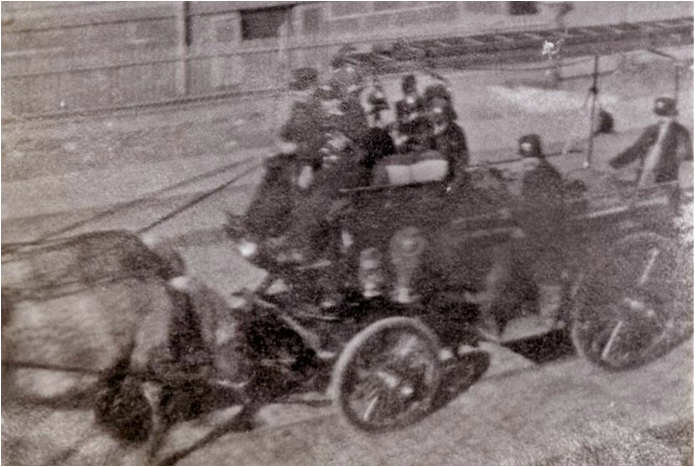 Those days are gone forever to the boys since the advent of the motor vehicles. 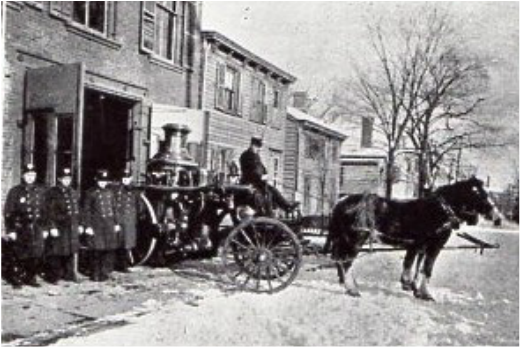 They recollect how back in 1910 the horses were gradually separated from their stalls in the spot where the traffic department is now situated on 112 Van Houten Street (quarters of Engine 1). In the short space of 3 years all of the old faithful's found new homes and owners. 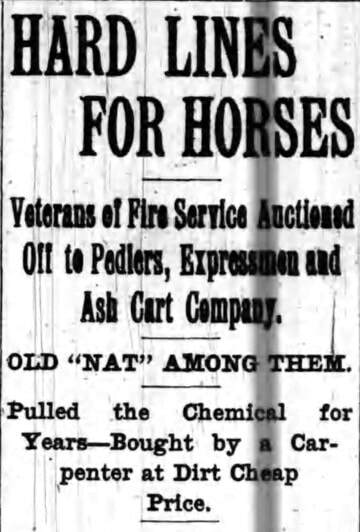 Many of the mares were auctioned off and others were placed in the fate of the city. 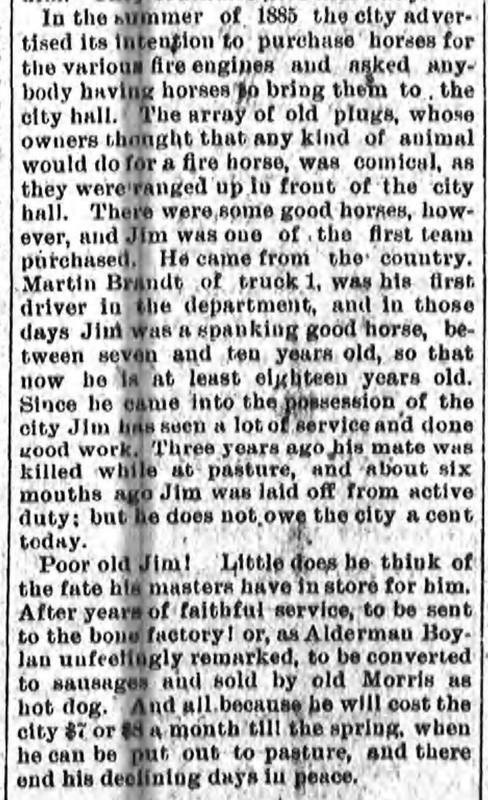 Some went to the almshouse and were given light work others took on a different vocation. 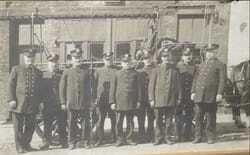 Soon their numbers dwindled and their rans dwindled to a small proportion. 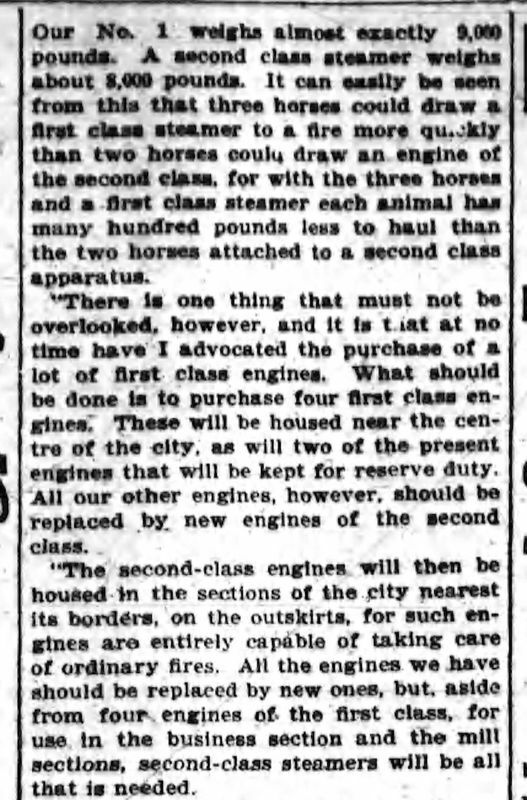 And up to the year of 1913 the 25th anniversary of the introduction of the motor engines only three horses remained. 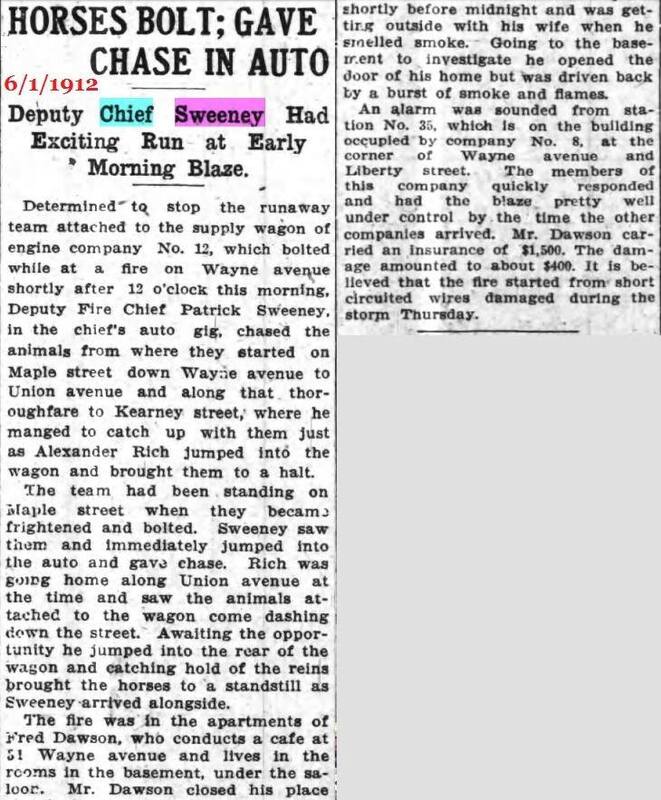 The following year the chestnut nag that was in in this city's employment passed into the great beyond, leaving only Arthur and Chief. 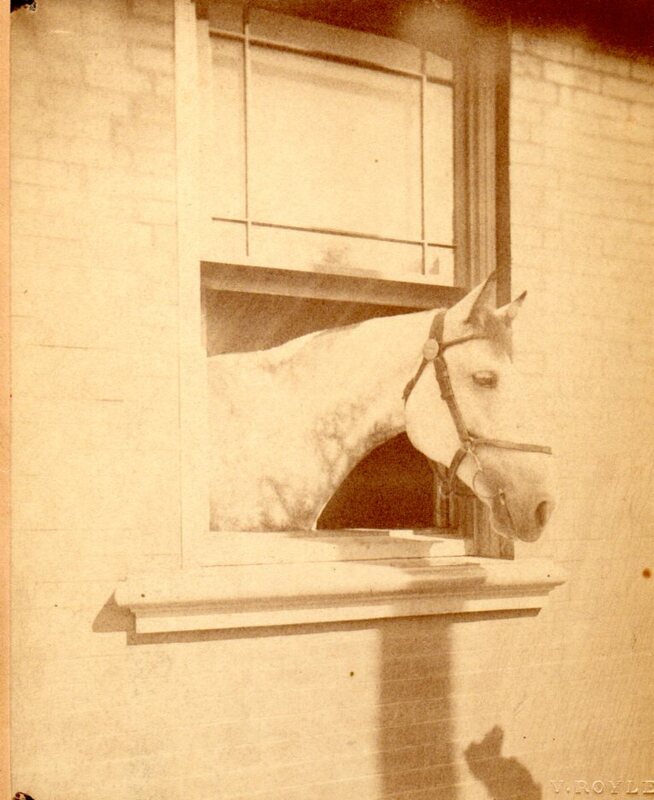 Chief and Arthur have few callers at the park and are a rather lonely pair. But they do not care for visitors. They do not ask for anything but to return to the fold for one day ans then they would be happy. 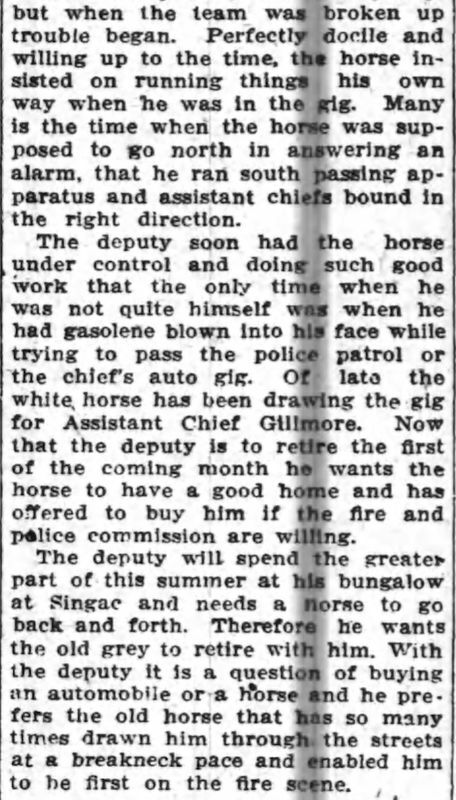 Superintendent Robert J. McCrowe takes good care of the horses and personally sees that they are cared for in the manner that befits a veteran of the old fire days. 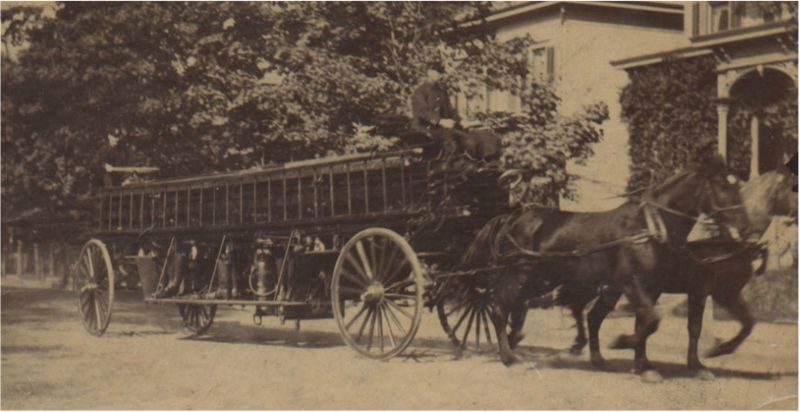 They are given the best of oats and bran. 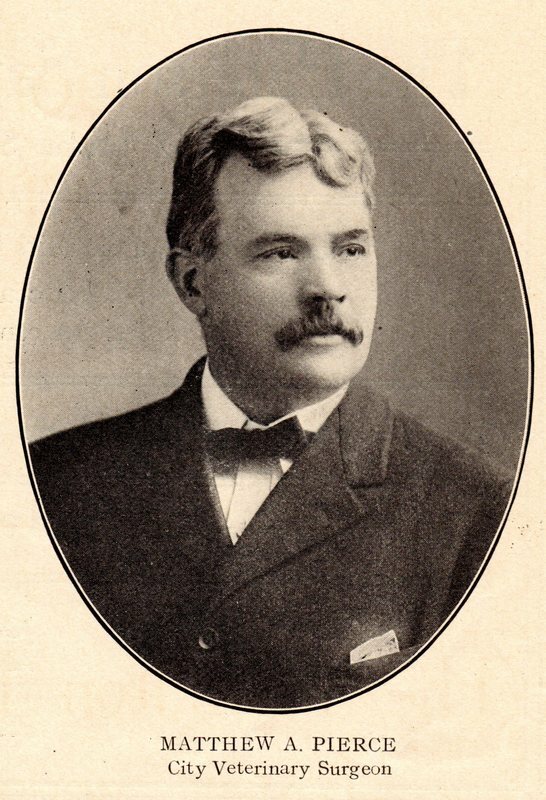 Hay is provided in no diminishing quantities and they have no boss for the rest of their days.